The mighty instant messaging application Snapchat bluster almost 100 million active users who share 700 million photos or videos within single day along with the 500 million views per day. Therefore, the statistics alone proves that Snapchat marketing needs to consider a leading item for the marketing sector. Snapchat is no doubt one of the biggest platforms for business and for clients. Why is Snapchat the best platform for marketing? It offers plenty of additional advantages which attract the marketers towards it. The very best part of Snapchat is, it has less competition as compare to all other social media platforms such Facebook, Whatsapp, Tinder, Instagram and many others. It attracts the new audience to your product or brand; it provides very different experience to the marketers and marketers gets totally natural and genuine as compare to other digital media platforms. Numbers of products and high profile personalities are tending towards the Snapchat platform in order to display “behind the scenes” latest project in the shape of movie or product, especially getting influence on the young audience. The very crucial thing need to understand is that how a social media platform such as Snapchat will help you out to reach your target audience. Most of the Snapchat users are below the age of 25 and only 12 percent users are at the age of 35-54. Dramatically female users are in larger numbers, up to 70% and only 30 percent are male users. Let’s suppose if you are chasing the youngest female audience, then Snapchat would be your best choice. But don’t lose your heart if you are looking for men having mature age up to 35, it does mean that Snapchat is not favorable for you. According to the recent research reports, currently, the mature male users more than the age of 25 are signing up for a Snap chat. The platform which doesn’t have the groups that are not at the moment available is older people more than 55. 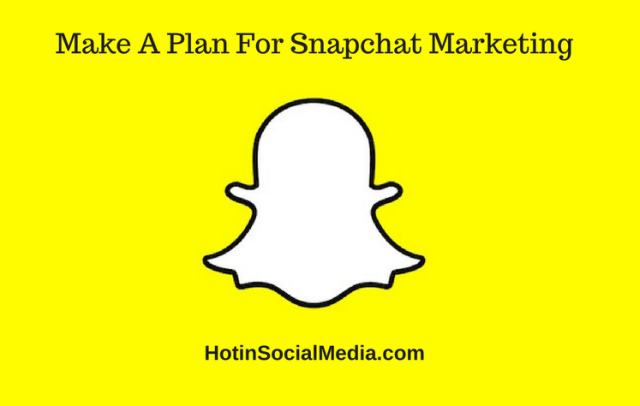 You just need to create a Snapchat account for business and then start creating content. Once you have created a profile and get started to follow people and sharing snaps and stories, along with the little logical strategy you will get success. There are plenty of tactics and strategies you can apply to your Snapchat marketing content, which can give you major breakthrough for a successful business. Following are a type of content you need to share. Capture images and then suddenly shares it on the Snapchat Platform, or even you can update an image through your cell phone photo gallery. Apply some sort of designing on your images for Snapchat portrait mode; this is the best plan to see images on this social media platform. You can also make 10 seconds long videos and then share it on the Snapchat and these videos also can be edited in the same way to the images. You can even share snap chat stories which can be created through your images and videos. The story needs to be the story of your day, the story regarding your brand, regarding your event which you are attending and many others. All of your followers will be able to see your story which you have been created through images and videos on a sequence form. The messenger has editing tools, you can Draw and use plenty of different colors and can add on any part of your image, video and on the screen. You can even add captions to the image and video, you just need to select the proper place to add the caption. You can also add Emojis and stickers along with the animated images within any image. You have power how long you want your audience to see your image, you can even make assumptions regarding time and how it impacts engagement. Few may say longer time increase the level of engagement and few say it only depends on your post. Keep in mind make your profile like an open book, everyone can see your profile. Snapchat has recently released an update which allows users to send private messages to their followers. This update can be utilized creatively between the product and customer. The social messaging application offers their user’s audio and video calling, a user can also send photos while chatting with the person through this feature. Marketers can easily share images and videos to their followers and even your followers can easily give you their feedback. So you can make the business marketing campaign. You can measure the response of your campaigned material through your audience in following way. How many times snaps viewed by your audience. How much time User response to your snaps. How many users want to chat with you when viewed your snap. There are some following practices which are very helpful to measure the success of your campaign you have made on Snapchat. Influencers are available on every social media platforms and they are also active on Snapchat. Through creativity, influencers can attract plenty of new followers to your Snapchat platforms. Creating hype is one of the greatest strategies for your business and events. Marketers can build Snapchat stories and display the scenes and footages to building up an event through sharing snippets of VIP information with your audience. You can even reveal exclusive news stories regarding your event; you can provide special offers to your followers available on Snapchat. Ads need to run the stories on Snapchatters profile and 10 seconds long video ads. The price tags on these types of ads are very high which is specifically available to larger corporate groups. This is actually a piece of artwork which instant messengers (IM’s) apps users enable to use at the very top of their images at the certain location.